This critique of property examines its classical conception: addressing its ontology and history, as well as considering its symbolic aspects and connection to social relations of power. challenges to the Western idea of property posed by colonial and post-colonial contexts, such as the disempowerment through property of whole cultures, the justifications for colonial expansion and bio piracy. 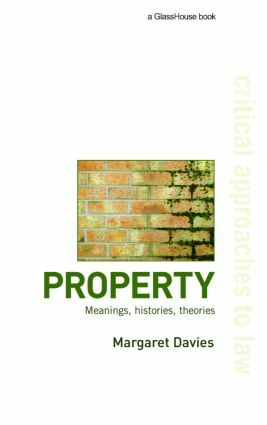 Dealing with the symbolism of property, its history, traditional philosophical accounts and cultural difference, Margaret Davis has written an invaluable volume for all law students interested in property law.